I first discovered Jurlique about ten years ago, after getting myself a nasty bruise whilst on a trip to Brisbane. My host smothered the affected area with their arnica cream, and I’ve been interested in the brand ever since. Once exceptionally difficult to find in the UK, their products are becoming easier to track down over here these days, which is a good thing as they’ve also massively expanded their product range in the last couple of years too. This isn’t your normal scrubby-type exfoliator, this one, you apply a thin layer to your face, leave it in place for five minutes then rinse it off. No massaging, and no potential eye-irritating beads or seeds. It’s basically a mask which contains a mix of enzymes which will make your skin softer. And, it really does. Several fruits (papaya and pineapple spring to mind) contain an enzyme which soften skin – and, if you’ll excuse me for mentioning it, they will also tenderise meat – and this mask makes the most of that softening effect. In use, I found that this gave me a very definite tingling sensation, which means I’d use it far less often than the 2-3 times a week recommended on the packaging (and in all honesty, I don’t think anyone needs to exfoliate this thoroughly more often than once a week anyway), but once rinsed off, skin was noticeably softer and more than a little smoother, I liked the effects a lot. Skin also had a rosy glow after, but that could have been from an increased blood-flow to my face from the tingling! An important thing to add about this product is that several of the ingredients are a natural source of Alpha-Hydroxy-Acids (AHAs) and they will increase your skin’s senstivity to the sun, so if you do use this, please ensure you use a sunscreen for at least a week after, otherwise you may get sunburned, even in cloudy conditions. 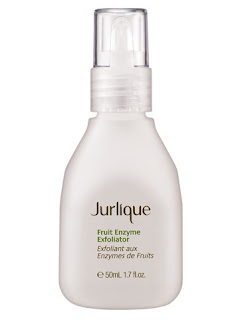 Fruit enzyme exfoliator costs £33 at the official Jurlique website here. I also tried their Soothing Herbal Recovery Gel, which in all honesty, I can’t rave enough about. I have a couple of allergies which have a tendency to cause hives when I come into contact with particular irritants, and this little bottle has been a godsend. Ostensibly, it’s a moisturiser for sensitive skin, and as such it works fine, it’s pleasant and refreshing to use, and, while I don’t like it as much as a more traditional cream or lotion moisturiser for that purpose, it’s nice to use. However, on hot, irritated, or blemished skin, this stuff really comes into it’s own. On hives, this instantly soothes the burning, itching sensation, and helps to reduce any swelling. Plus if you suffer from headaches, a thin layer of this left “mask-style” on your forehead and temples really helps to soothe and cool a hot head. I love this stuff, and keep my bottle of it handy at all times! My skin doesn’t normally tolerate gels all that well, but I had no issues with this one at all. 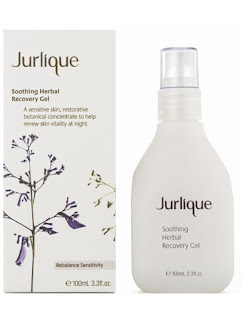 Soothing Recovery Gel costs £45 at the official Jurlique website. Finally, I also tried their Moisture Replenishing Day Cream, which is a thick yellow ointment with a faintly dusty, herbal smell. The dusty smell is from the chamomile which is a major ingredient of this cream. Specifically formulated for dryer skins, this does give a nice moisture boost to the skin without leaving you feeling too greasy. I’ll be honest, I like this cream, but I don’t love it. It does what it says it will, with no frills and furbelows, but let’s face it, I think I like a little luxury – or at least a little multi-tasking – from my face cream. To be fair though, it doesn’t promise to do anything outside of making your skin soft, so on that count, it really delivers! Moisture Replenishing Day Cream costs £27 at the official Jurlique website. Have you tried any Jurlique products? What did you think? You can also find Jurlique products at Zuneta (where the Soothing Herbal Recovery Gel is on sale for an amazing £5.88!) and Being Content. The Small Print: This post features a mixture of products I bought myself and items sent for review purposes. It doesn’t matter which is which, I like what I like, and I don’t what I don’t, where it came from is not of any relevance to that. So there. Next Post Great Customer Service? Looks beautiful. I first heard of Jurlique about 10 years ago when I had an Australian colleague and I'd love to try it but…too rich for my blood as they say. How funny. I was selecting products from all the ranges in my store today to use and the Jurlique Fruit Enzyme Exfoliator was the only exfoliator I selected. Am not surprised to see it got a rave review, it looks incredible.